So I have 66, 64.75, 62, 61 and 60mm piston sets I have modified for the 650. Most for stock cam, 1 set for turbo, 2 550 sets, and 1 set for a lumpy cam. 9 useable sets in total. Cb750, kz650 and kz750 pistons are the easiest to mod I have found in abundance. 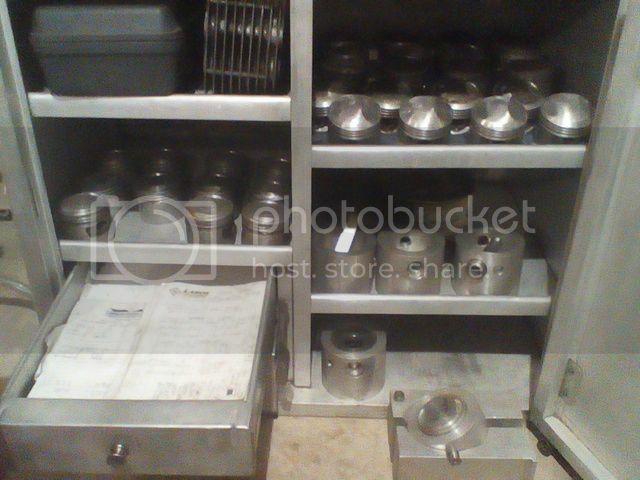 The piston pots and mill fixture are made by me. Re: My piston sets and fixtures. That's a skill I would like to know about. I'm sure some other non-machinists would love to see a write-up with pictures on how you modify pistons for another engine! Are you a machinist by trade? Yes I am a machinist. Trained in '98/'99 been in the trade ever since. Lots of repair shops, manual machines, and vtl lathes. I'm CNC functional.... more a fat finger at the console programmer than a mastercam user. I first got the idea of modifying pistons when I saw what NOS piston sets cost, and I found 1 overbore set that sold on ebay for over $600. I was told there is no way to getting a 650 overbore for a fair price on a few honda cb forums. So I ended with the first useable set I could get rings cheap for. A 76?77?... the first year of the cb750 hondamatic. It has a higher dome than any other cb750. Thats the first piston pot I made. 61mm. Shortly after, piston pot for stock 59.8mm pistons. Turned only a little off of them in the manual lathe, I think it was the skirt mainly. I basically copied a cb650 skirt length, deck height. That first set, I set a manual mill up, and angled the head and positioned the valve pockets by mimicking where they were on a stock set. And now I had 2 piston lots, 59.8mm and 61mm. The piston pot is basically a thick walled aluminum sleeve with a custom bolt that goes through the wrist pin bore to hold the piston while machining it in a lathe. In a mill it was a challenge to be able to get both valve pockets in the exact position in 3 axis, without 2 setups. But I came up with a fixture I could set a hardened steel pin to center a cnc z,y,x on, and run 2 programs, one for the intake, one for the exhaust valve pockets. had to use a manual mill to make the aluminum fixture, but I now have a fixture that fits a common good quality vice in most machine shops. Been a while since i looked at them, but with the overbore to 62mm going on, thought I'd show them off since they were out. Cb673 wrote: Yes I am a machinist. Trained in '98/'99 been in the trade ever since. Lots of repair shops, manual machines, and vtl lathes. I'm CNC functional.... more a fat finger at the console programmer than a mastercam user.